This quickly released live recording from Dunelm is an important social document, one which also makes widely available a thoroughly enjoyable piano recital, impeccably played by Peter Jacobs, famous champion of British music. Living composers from the West Country, in their 20s to 70s, are featured, interspersed with three groups of Preludes by the Gloucester-born Ivor Gurney. Richard Cardon (aka Sulyen Caradon) provides notes which tell a fascinating story of lives in music and the formation of a composers' alliance in the area (one of twelve similar groups in UK, would you guess? - "composing is a lonely occupation"). 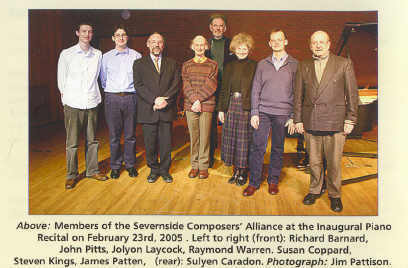 Most of the Severnside composers are, or have been, engaged in music professionally, but Raymond Warren's might be the only name known to many readers of Musical Pointers. 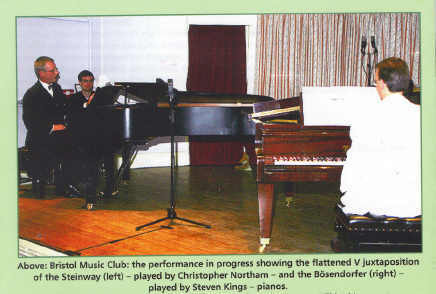 This piano recital, Severnside Composers' Alliance's inaugural concert, was delayed 'because of unsuccessful attempts to get it into a concert series somewhere'; shame upon those who refused to become involved! The music is nearly all 'accessible contemporary', without any of it simplistic or minimal. Richard Barnard's Irish folk tune 'hidden between layers of melody and pulse' is the most radical piece. Geoffrey Self's Sonatina, written for a clavichord that he'd built in the '70s, is unashamedly derivative, 'what used to be called "light music"'. Susan Coppard, who'd long 'doubled as a professional accordion player and Town Clerk of Bradford on Avon' has a pleasant piece composed at Canford Summer School upon 'the most outlandish mode she could devise'. The well-filled CD finishes with two movements (only) of Raymond Warren's sonata, its Monody a fine example of a fascinating genre (do you know Alain's Sonatine Monodique?). I look forward to playing the Self sonatina on my clavichord and Warren's sonata (all three movements!) on the piano. Do buy this admirable CD, which boasts fine recorded sound and attractively illustrated presentation by Jim Pattison, instead of loading your shelves with yet more standard repertoire from the latest hyped young contender to get the publicity and advertising. 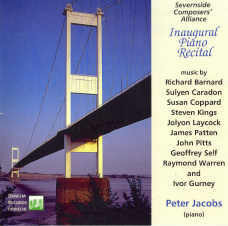 A second CD from the Severnside Composers' Alliance has a recital by two local pianists, Steven Kings and Christopher Northam, taken live from another concert in Bristol. Most successful are Bedford's Hoquetus David, a welcome reminder of Birtwistle's curating of the best ever South Bank summer festival; Changes by John Pitts (photo above) with its 'scary' 14 against 15 counting managed heroically; Lutoslawski's Paganini Variations despatched with verve and aplomb and, especially welcome, a section of Robin Holloway's Gilded Goldbergs, which left me wanting to hear the whole. That excerpt might better have been placed first on the track listing instead of the tricky Martinu pieces which need electricity at a higher voltage to come off. Jim Pattison explains the difficulty of recording at the Bristol Music Club, the capacity audience deadening the sound. Might opening the curtain have helped a little? 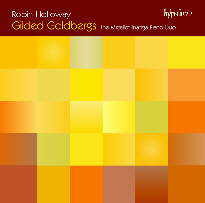 Without the inclusion of eight of Robin Holloway's variations in the CD reviewed above, I should not have become aware otherwise of this exciting double-CD's existence, and it has ended a lengthy period during which Musical Pointers has not been able to review Hyperion's releases. Readers will know that we are equally interested in CDs 'buried' in back catalogues as in the latest releases which are the concern of most review publications). It is a wonderfully interesting recording, supported by a fascinating and candid account by Bach's most recent 're-composer' of the humble beginning of what grew into a major new work in its own right. Looking it up on the web, I found Andrew Clements' enthusiastic review and was determined to hear Gilded Goldbergs complete. This is one of the most captivating and invigorating duo-piano recordings in my collection, and I have played it through twice. Holloway never takes you too far away from the theme and he is infinitely inventive - bringing many a smile to those of us who know the original well and have struggled to play it. The Goldberg Variations have attracted numerous musicians to do it honour. Two of my favourite arrangements are József Eötvös's for guitar and Uri Caine's elaboration for a larger ensemble. The Micallef-Inanga Duo is highly professional and their recording of Robin Holloway's recomposition exemplifies the 'binding chemistry' and exceptional 'ensemble, sensitivity elan and musical intelligence' as claimed in the liner notes. I trust that everyone in the Alliance will purchase Gilded Goldbergs for their own pleasure and to help Hyperion a little in their hour of need! I cannot resist reproducing the intriguing back-cover photo they chose. - - of considerable interest is Uri Caine's working up of Bach's Goldberg Variations, which looks at this masterwork from many perspectives, yet without quite the meaningful assimilation which gives his Mahler project such an enduring resonance. The double CD Aria and 70 Variations for Various Ensembles (W&W 910 054-2) has Caine playing a copy of a Silbermann fortepiano, a modern piano and a Hammond organ, with an assemblage of tracks from classical choral and instrumental groups, jazz players and vocalists reflecting the current scene, in which musicians are happy to collaborate with those from other genres - - it is an interesting novelty and may well encourage Caine afficionados to explore the original masterpiece. P.S. A lot of hyperlinks in this report; tell Musical Pointers if you've enjoy following them?